Fish & Game Funding: He who pays the piper calls the tune? Tug o' War: Local Politics, A National Trend. Its been said that “he who pays the piper calls the tune”. But is it really that simple? The success of wildlife management and conservation of wildlife stems directly from a well-crafted model known as the North American Model of Wildlife Management. The North American Model was founded so that each generation of citizens in The United States and Canada have the opportunity to experience wildlife in their natural environment. This established model is second to none, and regarded as the most sustainable system the world has ever seen. In 1937, sportsmen successfully lobbied Congress to pass the Pittman-Robertson Wildlife Restoration Act, which put an excise tax on the sale of all sporting arms and ammunition. This was followed in 1950 by the Dingell-Johnson Act, which placed a similar tax on fishing equipment. Today, every time hunting and fishing equipment is purchased, a contribution of that purchase is directed to this fund. It generates upwards of one billion dollars per year. The money from these funds have been used exclusively to conserve America’s key wildlife habitat. When funding from this excise tax is combined with individual state license and tag sales sportsmen pay each year, it constitutes the majority of funding for wildlife in North America. Contrary to popular belief, these funds and the conservation projects they support don’t just benefit hunt-able game species - but all wildlife. In the mid-1800’s hunters and anglers realized the need to set hunting limits to protect rapidly disappearing wildlife, and assume personal responsibility for managing wild habitats. Hunters, trappers and anglers were among the first to rally for wildlife protection and still remain some of today’s most important conservation leaders. Today, trust has been placed upon national, provincial, and state wildlife agencies to oversee the majority of wildlife management decisions; which include setting regulations, bag limits, and hunting/fishing season lengths. These decisions, in recent history, have been made by agencies with the input of the public, biologists, management professionals, and sound science. One of the key principals of the North American Model of Wildlife Conservation is the idea that wildlife is held in a “public trust”. Essentially, wildlife belongs to “the people” and it is the perceived duty of state wildlife agencies to ensure proper management of wildlife in the best interest of the public. For years this has aligned with the concept of “reasonable and regulated use” of wild resources without causing detriment to the overall conservation and/or abundance of said resource. Many state agencies oversee their rule-making by way of Fish & Game “Committees” or Commissions, which in many states require individuals appointed to be in possession of a hunting, fishing or trapping license as part of the appointment process. Today, many feel these requirements are in place to ensure laws and regulations are made with regard to conservation, overall wildlife health, and public safety rather than anti-hunting sentiment. It also ensures fair, reasonable use by a cross-section of the public who hunts, traps or fishes. For years, this one major roadblock has stood in the way of hunting & trapping critics, who would obviously prefer to see management decisions lean in favor of animal rights ideology, rather than sound science & management. More and more, we are hearing and seeing testimony and anecdotal debate arguing that hunting activities are perceived as “declining” in popularity; thus suggesting management decisions should be made by the “non-hunting” sector of the public rather than based on traditional game management. Over and over the same narrative is presented by an anti-hunting constituency - “the majority” of the public doesn’t hunt or fish, and therefore, these actives are supposedly no longer relevant to wildlife management, conservation, or the decision-making process. In turn, hunting and trapping activities are harder to eliminate when biologists and state agencies are promoting the benefit these regulated activities provide the greater conservation community. By removing the hunting, fishing, and trapping aspect from the wildlife management equation, critics of these activities have a much easier time manipulating state laws which pertain to hunting seasons and regulation. Clearly, its no secret that the ultimate goal is to eliminate the “human-use” element of natural resources. In some states and provinces, the “battle” has already been won by hunting critics, and many of these “committees” and state agencies have already “overthrown” the hunter’s voice. In other areas, the “battle” for the general public’s “middle-ground” approval is still fought between the hunting/fishing community and hunting critics. Protestors stand outside NH Fish & Game Headquarters during a NHFG Commission meeting on bobcat management. A tug-o-war over the control and “say” of management decisions has raged for years. In New Hampshire for example, a legislative audit of the state’s Fish and Game Department operations in 2008 was a catalyst. Debate about management decisions reached a boiling point in 2016 when the state’s Fish and Game Commission (a public board tasked with overseeing Department policies on hunting & game regulations) withdrew its plan to reintroduce bobcat hunting in New Hampshire after highly publicized opposition. More recently, a piece of 2017 legislation known as Senate Bill 48, set up a political committee to essentially study the relevance of NH's Fish and Game’s policy-making Commission. SB-48 was effectively amended by the NH House of Representatives in 2017 to focus on funding NH Fish & Game, rather than emphasis on governance and policy-making. Historically, activists against hunting, fishing and trapping have relied on legislative ping-pong matches to restrict these activities. Since New Hampshire is not a referendum state, the traditional tactics from special interest groups (who rely heavily on public smear campaigns and fund-driven investment in marketing "animal rights" ideology to the public) fall short, as the ultimate decision for game management rests on the shoulders of a governing board. Its far harder for anti-hunting lobby groups to influence the decision-making of a well-informed board than it is to fuel a mob-rule public campaign. The NH Fish & Game Department has typically set seasons and restrictions on the take of game with scientific data, rather than emotion. With no hand readily feeding them, animal rights groups & anti-hunting critics (both local to NH, and with national ties) strategized to dismantle the NHF&G Department's game governing body instead. Many states across the country have produced headlines in recent years that echo similar campaigns to tear-down the management structure of wildlife management agencies. Part of the NH Senate Bill 48 movement hinges on the breakdown of funding for New Hampshire’s wildlife management agency. 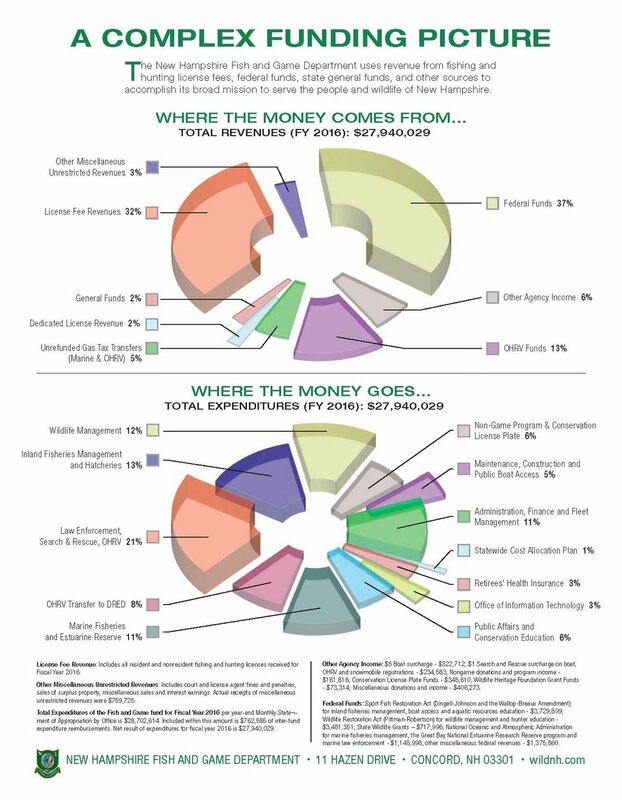 Local “coalition” groups presented pie-chart breakdowns of federal funding to lead viewers to believe the outdoor sporting community no longer contributes to conservation funding. These same arguments form the basis for numerous anti-hunting campaigns across the country. Pittman-Robertson and Dingell-Johnson funding was dramatically skewed by many of these groups, and in some cases, was almost non-existent. The removal of these important funds more often than not traces back to the incredulous accounting of the anti-hunting group "Nevadans for Responsible Wildlife Management" (NRWM), as well as a 2011 "Boating Survey" which relies on a 3% return of ALL 118 million households in the USA answering to the question, "Did anyone in your household fish from a boat last year?" Not surprising, NH Fish & Game’s breakdown of funding dramatically differs from funding charts provided by anti-hunting coalitions (which greatly skew important percentages of funding). A full report on New Hampshire’s Senate Bill 48 can be viewed here. New Hampshire isn't the only Fish & Game Commission to be placed under the microscope of hunting critics. Vermont recently went through a similar, if not eerily mirrored debate. California, Wyoming, and Nevada, amongst several other states, have also seen recent attacks on their Fish & Wildlife Agency Boards when votes or decisions don't go the way hunting & trapping critics desire. Nationally, its become an expected chain of events that any fish & wildlife agency with a governing board will be criticized at some point over the management of wildlife. These attacks are typically followed by state-by-state political legislation seeking to strip decision-making powers from state agencies and replace governing boards with "non-consumptive" or "non-hunting" interests. The scientific community has also been dragged into the debate. Some ecologists opposed to the regulated hunting & trapping of predators have produced reports and editorials suggesting similar arguments that wildlife management professionals don’t take enough consideration into “coexistence” or what they deem as “non-consumptive” activities, particularly with regard to large carnivores. This has prompted rebuttals from many in the scientific, biological and wildlife management professions (refer to Artelle et all Misses The Mark 2018 for an example). In more recent years, it has also been determined that the term “non-consumptive user” (used to describe hikers, birders, or recreationalists who don’t hunt) is an inaccurate misnomer - as every activity in nature elicits some form of impact to local wildlife (see our report “Do No Harm”). Today, many state agency policy boards and commissions are criticized merely for setting policies and wildlife management procedures based on sound science. Allowing an opportunity to hunt and trap natural resources in a regulated fashion for members of the public who wish to do so is a far cry from the accusations that agencies pander only to a “hunting constituency”. This assertion tends to often form many of the arguments against state hunting policy regulations. Debates on predator management also appear to be a driving factor in many of these cases. While there are exceptions to every rule, many of the assertions that hunters receive “special privileges” in wildlife policy decision-making are determined to be merit-less. As for decision-making, having experience with the natural land on an intimate level is imperative for a proper perception of wildlife management needs. When a call to cull is needed to sustain healthy wildlife populations, can the self-proclaimed “broad base” of the non-hunting sector opt to pull the trigger? Most concerning, the vapid accusations that hunting critics “aren’t properly listened to” when a management decision doesn’t go “their way” has the capacity to greatly cheapen future public input and testimony - thus threatening the validity of management concerns when a species truly is in need of added protections. This is not to say non-hunting commentary on management decisions shouldn’t be properly considered or documented. Furbearer Conservation supports the regulated hunting and trapping of wildlife when those activities are based on sound conservation & science, benefit the public as a whole, are humane by scientific and measurable standards, and/or assist with continued biodiversity within the wilds of the natural North American environment. Many species of suburbanized furbearers are not regularly “hunted” in a modern sense, and as such, require additional management through regulated trapping to ensure sustainable levels of healthy and abundant populations. We will continue to support open communication between the hunting & non-hunting sectors of the American public and encourage state agencies to make future decisions based on sound management science. We will also continue to monitor, report on, and when warranted, elicit criticism on these topics as they arise.